Rev. John Humphries, age 91 of Clarkesville, went home to be with the Lord on Friday, November 30, 2018. Born on July 15, 1927, in White County, he was the son of the late Aaron and Maude Crow Humphries. As a young man, Brother John was saved and born again in September of 1947. 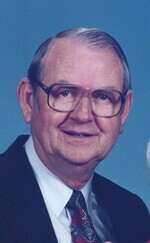 A few years following, he was licensed to preach in June of 1953 and them was ordained to preach in November of 1956. Brother John was a bi-vocational teacher, preacher and pastor. He was a husband, father and was employed full-time with the trucking industry as a driver. He was also employed part-time with McGahee-Griffin & Stewart Funeral Home for some time. He encountered many people in churches and in his work and was always a faithful witness of the gospel of Jesus Christ. He was an ole’ fashioned preacher who performed weddings, officiated at funerals, ran revivals and visited the sick. It was often said that he visited people more than full-time pastors. He really loved and cared for people. He and his wife wanted everyone in the churches he pastored to feel that they were important and a vital part of God’s outreach ministry. For the past 65 plus years, Brother John has organized, pastored or assisted at the following churches: South Side Baptist Church, where in 1952 he began teaching Sunday School; Antioch Baptist Church in College Park, where he helped organize the church, teach Sunday School and was interim pastor; Bethlehem Baptist Church in Riverdale, where he pastored; Sunny Side Baptist Church in College Park, where he helped a group begin the church and then pastored until December of 1962; Benteen Baptist Church in South Atlanta, where he pastored; Brookwood Baptist tabernacle in Southeast Atlanta, where he pastored. This church relocated to Jonesboro and called itself Jonesboro Second Baptist Church. Pastor John Retired from this church and moved back to Habersham County with his wife in 1989. This church once again relocated to a much larger building and is now known as Harvest Baptist Tabernacle in Jonesboro. God has blessed. Growth has happened and this church’s outreach has been enlarged. While pastoring Benteen Hills and Brookwood Baptist Tabernacle, Brother John had a radio ministry that spanned 20 years and was a blessing to many people. The radio program from Brookwood was broadcast live each Sunday morning. If you are a Christian and make yourself available to God to be used in His service, quitting is not an option. After moving to Habersham County, Brother John was called to pastor Macedonia Baptist Church and Stonepile Baptist Church. He has done interim work at Hazel Creek Baptist Church, Providence Baptist Church and Glade Creek Baptist Church. He has also supplied for pastors in Habersham and the surrounding counties. Brother John was always faithful to God and the church. He never missed a service unless he was really sick or bedridden. He did not look for excuses to miss church, he always looked for the remedy to continue on due to his love for the Lord. Brother John was a big believer in learning all you could about the greatest book on earth, the Bible…….God’s inspired Holy Word. He studied Hebrews, St. John and Old Testament Survey from Emanuel Bible College. He studied numerous correspondence courses from Moody Bible Institute. His quest for knowledge led him to study books from Clarence Larkin, Dr. M.R. Dehann, Dr. Criswell, John R. Rice and Oliver Green. Adrian Rogers was a great inspiration and encouragement. He received The Sword of the Lord magazine since the 1940’s, along with many other gospel magazines and papers for personal help and growth. He was always willing to learn from other great preachers of the Word. Brother John was a New Testament teacher. He taught scripture verse by verse and instructed where church laymen could understand the Bible more clearly. He has always wanted to see the local church reach out into its own community to help people who are hurting and in need. He wanted the church to know what it believes and why. Brother John had a pastor’s heart. He loved to see people saved. He was a friend and great encourager to young preachers having just been called into the ministry. He shared his pulpit and gave young preachers the opportunity to preach and grow. He knew they needed prayer and support from the local church and a chance to build their confidence. Brother John has put his hope and trust in the Lord Jesus Christ. He would like to ask you to do the same thing today! A note from his family: Remember that the greatest legacy you can leave behind is your good name, your faithfulness and the people you have led to the Lord. We leave this service knowing that Pastor John is getting to enjoy the heaven and the God that he has preached about all of his life. In addition to his parents, he was also preceded in death by a son-in-law, David Norton. He was the last surviving member of his immediate family. Surviving are his wife, whom he married on April 7, 1949, Zelma Spivey Humphries of Clarkesville; daughter, Marsha Humphries Norton of Mt. Airy; son and daughter-in-law, Rev. Tim and Von Humphries of Stockbridge; grandchildren and spouses, Rev. Adam and Amanda Humphries of Lula, Laura and Brandon Williams of Birmingham, Alabama, Charles D. and Lisa Norton of Cornelia and Eric Norton of Mt. Airy; great grandchildren, Addison John Humphries, Adrian Michael Humphries, Anniston Joy Humphries, Audrey Grace Williams, Avery Mitchell Humphries, Reid Michael Williams and Sadie Mae Norton; numerous other relatives and friends. Funeral services are 3 pm on Monday, December 3, 2018, at the Chapel of McGahee-Griffin & Stewart with Rev. Billy Burrell, Rev. Terry Rice, Rev. Adam Humphries and Rev. Tim Humphries officiating. Interment will follow in Habersham Cemetery with Rev. Kenneth McEntire officiating. The family will receive friends from 3-6 pm on Sunday at the funeral home. Flowers are accepted or donations may be made to a charity of one’s choice. This obituary is protected by copyright by . Proudly Serving the Community of CORNELIA. is located in the state of Georgia, United States.